With the elevated corridor being access-controlled, a majority of the traffic comprising DTC buses, interstate buses, two-wheelers, cyclists, trucks and autos now uses the road under the corridor. Says Ritiesh Gupta, a shopkeeper and resident of Badarpur, “It seems the elevated road has been just made for car owners. For those on two-wheelers and autos, there is no other option than the road under the elevated corridor.” The effect is apparent: the road is choked during peak hours even as pedestrians find it a nightmare to cross it. The stretch along the Sarita Vihar metro station as well as along the NTPC junction is fraught with danger as pedestrians weave through on-going traffic to cross the stretch. Lack of crossovers in the form of an FOB (foot-over-bridge) or underpass has meant that pedestrians are at risk, especially students coming out of the neighbouring government senior secondary school, say locals. Admits Satyendra Garg, joint commissioner (traffic), “The traffic situation is being monitored along that stretch. We are in touch with NHAI to provide traffic interventions but an immediate solution seems unlikely.” The congestion point is not confined to the loops but can be seen near the entry to the Badarpur elevated road as well. Commuters say that waiting time at the Aali Village junction is anywhere between 15-25 minutes during peak hours. Interestingly, the elevated corridor was built to tackle these problems. The reality though is that traffic congestion points have merely been changed or moved ahead. Instead of long traffic jams at the main junction points like NTPC, Sarai or Jaitpur junctions, the traffic now piles up at Aali Village junction or under the elevated corridor. Garg agrees the presence of the various flyovers along the Mathura Road hasn’t made any difference in the traffic movement of the area. “People waiting earlier at various junctions now get stuck at Aali Village. The solution is obviously not just flyovers,” admits Garg. The problem near the loops though, are due to a different set of issues, says Garg. “There are buses parked along the main road. This chokes the road as it joins the Mehruali loop on to the elevated corridor. Also, buses from Delhi, to avoid toll as well as crossing the border, take a U-turn along the loops, leading to congestion. This will be tackled soon as we’re clearing up the area,” adds the traffic official. But he isn’t so sanguine about the continuing bottlenecks along the Mathura Road leading on to the road under the elevated corridor though. “We’ve put certain traffic interventions but a long-term solution needs to be worked out,” said the official. Part of the interventions include putting in armed personnel along the Delhi-Faridabad border to stop movement of trucks before 9.30pm as well as asking NHAI to deploy more marshals. Traffic police claims it has deployed armed personnel along the Delhi-Faridabad border to stop trucks before 9.30pm. But trucks can be seen plying on the road all the time. NEW DELHI: The much-awaited Badarpur elevated road would now be opened for commuters from November 29, almost a month ahead of its official deadline. With this, one of the busiest intersections in the entire NCR would become signal free, bringing huge relief to thousands of commuters using the Delhi-Agra highway. But those using the elevated stretch to dash into Faridabad will have to start paying toll from November 29 afternoon. "We have decided to give the permission for commercial operation (CoD) for this project. The private developer will be allowed to levy toll after the stretch is officially inaugurated. Only a few works are pending which the developer has to complete in next couple of months as per the norms," said an NHAI official. Car users will have to pay Rs 20 per trip for using this 4km-long elevated road, as per the NHAI notification. Jeeps and all other private light vehicles need to pay Rs 20 per single entry. The notification further says that light commercial vehicles need to pay Rs 30 and for buses and trucks, one trip will cost Rs 60.
stretch. "They will use the ground road and hence, are exempted from paying toll. Those who use the stretch and have the benefit of bypassing all traffic signals beneath the flyover need to pay," said an NHAI official. Already the Faridabad-Delhi stretch of the main flyover has been opened, whereas the other main carriageway has been opened partially. Once completely opened, the travel time between Delhi and Faridabad will reduce significantly and it will also improve the connectivity to Agra. 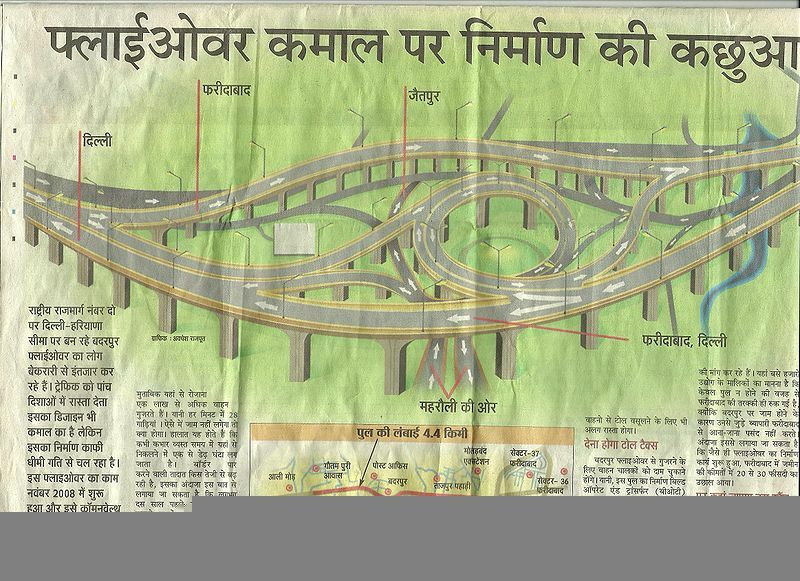 Earlier it had been reported that Delhi-Agra NH2 would be widened to 6 lanes by NHAI. The agreement for this 180 km stretch has been signed with Reliance Infrastructure.